Creative Patios and Landscape Design have been transforming gardens since early 2000. We pride ourselves on our quality workmanship and attention to detail, exceeding customer expectations in all aspects of our services. At Creative Patios we cater for all styles whether thats a more traditional landscape or contemporary makeover for your outdoor living space. You can be assured that we will work with you, taking your ideas to reality along with our professional advice and services. We pride ourselves on customer satisfaction and recommendations from all our customers, we constantly use feedback to improve our services. Our customer feedback can be via on our website or our Checkatrade business page. Creative Patio and Landscape Design welcome enquiries from Stockton-On-Tees, Yarm, Middlesbrough, Billingham, Hartlepool, Redcar, Marske, Guisborough, Stokesley, Wynyard, Darlington, and all surrounding areas. We offer FREE no obligation consultations and do not use high pressure sales tactics - our portfolio speaks for itself. Interested in seeing what we do, check out our portfolio page for a sample of some of our projects. A. 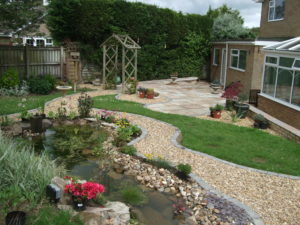 Each garden and design is unique, every project has to be priced on an individual basis, consultations are free and no obligation. Please contact us and we will arrange a visit at a time to suit you. A. Project lengths are dependant on design and your current landscape, you can rest assured that once Creative start work for you we will not leave and start other work until it has been completed. Q. Do you use contractors? A. No - All work is carried out by the Creative team. Q. Are you insured for the work you carry out? A. Yes we have full public liability cover.